Tropical Smoothie Café franchise opportunity: Are you considering it? You should be aware that data released by the Small Business Administration (SBA) indicates that Tropical Smoothie Café franchise owners who qualified for SBA-backed franchise loans have a high loan failure rate of 24%*. Are you familiar with the Tropical Smoothie Café franchise opportunity? If so, please share your experience, opinions or insights with a comment below. If you are a Tropical Smoothie Café franchise representative or employee, please leave a comment or email us at UnhappyFranchisee[at]gmail.com. Tropical Smoothie Café franchise owners have a 24% SBA loan default rate. The overall net growth of Tropical Smoothie Café franchises by 23% (from 244 in 2008 to 301 in 2011) might give the appearance of steady, failure-free growth. However, data from the Tropical Smoothie Cafe FDD (see 2nd chart below) indicates that within that same period, 67 franchises were terminated or reaquired. When doing your due diligence, it pays to dig into the numbers of the Franchise Disclosure Document (FDD) rather than rely on the overall growth figures available online. It’s likely that Tropical Smoothie Café franchise owners who received SBA loans may have collateralized their franchise loan with their homes or other personal assets, and many were unable to repay those franchise loans… despite the serious incentive to do so. The relatively high franchise termination rate of Tropical Smoothie Café is a franchise red flag. At the start of 2008, there were 244 US Tropical Smoothie franchises. From 2008 through 2011, an additional 124 franchises opened for a total of 368 franchises. During the same time 67 franchises were either terminated or reacquired by the franchisor. At the beginning of 2012, there were 301 Tropical Smoothie franchises open in the U.S.
That would come out to a termination/reaquisition percentage of 18%, which (we believe) could reasonably be called a failure rate. (The 24% figure is a default on SBA loans since 2001, so it may be that the actual failure rate earlier in the decade was much higher than in recent years.) Perhaps the company can clarify. How stable is Tropical Smoothie Franchise Development Corporation? Not only does that indicate that the franchisor appears to be in poor financial shape, but that it worsened by nearly $1.5M from 2010 to 2011. Minnesota requires the escrow of franchise fees due to the Franchisor’s financial condition. Another red flag is that the FDDs state that Tropical Smoothie Cafe franchisor does not grant an exclusive territory at all, and that another TSC can open up across the street and you’d have nothing to say about it. Are you familiar with the Tropical Smoothie Café franchise opportunity? What do you think accounts for the SBA loan failure rate of Tropical Smoothie Café franchise owners? What steps should Tropical Smoothie Café be taking to stop further franchise failures? Has Tropical Smoothie Café taken serious action to address the problems that led to these loan failures? ARE YOU FAMILIAR WITH THE TROPICAL SMOOTHIE CAFE FRANCHISE OPPORTUNITY? 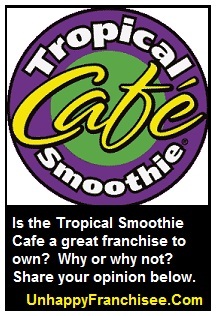 ARE YOU A CURRENT OR TROPICAL SMOOTHIE CAFE FRANCHISE OWNER? PLEASE SHARE A COMMENT BELOW. ← 1-800-Vending / Healthy You Vending Machines: Overpriced & Inferior? First I think the 24 % figure is incorrect- actual rate is probabley closer to 10-12%- I started as a franchisee with Tropical Smoothie back in 2000. Running any business is tough and when 2008 hit we saw restaurants of all types go under. Tropical Smoothie has a great product and gives great support and tools for the franchisees. But you have to do the work! many people enter a franchise thinking they can sit back and the money comes rolling in! You have to be prepared to work long hours-spend time marketing your business-hire the best people etc. It’s not for everyone! I just opened another location two weeks ago! This can be a great time due to the low rents and ample supply of former restaurant spots ! First off, there is a Tropical Smoothie Cafe not far from the UnhappyFranchisee.com World Headquarters, and we have to say that Tropical Smoothie does have quality products, both sandwiches and smoothies. That would come out to a termination/reaquisition percentage of 18%, which could reasonably be called a failure rate. The 24% figure is a default on SBA loans since 2001, so it may be that the actual failure rate earlier in the decade was much higher than in recent years. Perhaps the company can clarify. Not only does that indicate that the franchisor is in poor financial shape, but that it worsened by nearly $1.5M from 2010 to 2011. Minnesota requires the escrow of franchise fees due to the FRs financial condition. A final point is that since many franchisees are area developers, they perhaps have a vested interest in not disclosing some of the problems facing Tropical Smoothie Cafe franchise owners. If I am wrong about this last point, please let me know. I plan to add this additional information to the original post. Thanks again for your comment. We hope to hear more from Tropical Smoothie franchise owners and the franchisor as well. Man, a franchisor that does not make money and has the same language in its F.D.D. as other franchises! At least with Matco Tools they make millions when they screw their franchisees. I agree with the report. As a former franchise owner in Ohio, Tropical Smoothie and their representatives did very little to help me as a franchisee. If you’re fortunate and have a great location…and the word is location, and make a lot of sales initially, they like you. If you don’t, then you are pretty well screwed. I lost a lot that I had due to deception from the area director who inflated the numbers of potential with the Franchise. When I requested help I was ignored. Check the Dayton and surrounding area market. Very unhappy franchisees. The food cost less if you buy locally then from the vendor they ask us to use regarding many items. I worked countless hours a week. I didn’t sit idly and expect money to come pouring in. But you give 100% and the company figures since you are not among the top producers they will ignore you. Everything regarding the above article is right on the money. To bad I didn’t realize I was being misled. To late for me. But buyer beware. i was a former franchisee owner in the new york city area.my area sales developer guys were great.anything happened and they both were there.time went by and things were good.but then started noticing that headquarters was taking more money from time to time than they were suppose to. that girl jessica very hard person to deal with.adding to the wrench throwing my a.s.d. guys had some kind of fallout with headquarters.till this day dont know what happened but i know there is somekind of lawsuit.well after this happened i had no support at all! i used to call for help but fell on empty promises from headquarters.eventually with time it went downhill.i struggled and held my hands out for help….but to no avail. i ve been following tsc and heard from other unhappy franchisee s .think i was the last store in nyc.till this day ,years later no tsc in nyc…hmmmm.makes me wonder what happened.all in all was not happy in the end. I went to thetropical smoothies on blue diamond sat july 12 at 12.30 they people is not friendly and i wait for about over 20 min and when I ask for my smothies the respond is somebody took your smoothies. So i need to wait for my smoothies again the girl make my smoothies is very unfriendly and i don’t see her wearing the name tag so i don’t know her name she is asian girl.and she never say sorry either i went there quite often so most of the time is the store is not pleasant. and they r too long for oe order. I wish can be better. Thank You. My daughter has worked at one of the stores for 3 weeks now, only a total of 12 hours. And this manager never makes a real schedule for her just calls her in 15 minutes ahead of time, then says she’s too slow for this job can’t use her! No one learns on 2 hour shifts one to two days a week!!! I worked at a Troooical smoothie in va as a kid for almost a year! I was apart of the first crew hired when they first opened. I loved it! The initial training was by far the best training I have ever received for a job. The food and smoothies were great! They had a very high level of cleanliness. We had tons of regulars. The management was green and that was what did me in eventually but to this day, I actuallly miss making smoothies and working there. I was actually interested in starting one up but now that I seen this, maybe not. It’s really unfortunate because they have such a good product! The potential is there! I have had poor customer service for the past few weeks every time I went into tropical smoothie, I feel that they do not value customers nor do they care whether or not they have any business. They roll their eyes at customers, and look begrudgingly every time one walks in the door. It is not okay. They talk about customers when they walk out too. Yesterday I was in Tropical Smoothie near Hanes Mall in Winston Salem North Carolina. There was a Lead that was cursing up a storm when i spoke to her, and told her I don’t appreciate you saying the F word. she proceed on and wouldnt stop and then stated told to me that F God. and also stated to me that her God tells me to cures anytime. Not professional coming from a lead and the GM never wrote her up and never terminated. It I was told by the GM never to come back to the store. I will never see myself so close to christmas season or any other season to ever go back. Im a Christian who loves Jesus. To all Christians that respect and love God stand in prayer for me. i worked at TSC for a month and it was awful. The new “owners” did not follow any of the rules and guidelines that were implemented by the area developers infact they did quite the opposite. we were not allowed to communicate with eachother (even though the area developers told us communication is a big part of the job) and they would get yelled at if we were sick. and instead of using the proper turbinado required, they replaced it with store bought regular sugar. After requesting off for a religious holiday (which i am legally allowed to ask for and recieve) i was laid off. The professionalism in the Tropical smoothie cafe that i worked at was awful. They wouldn’t even hire real managers it was just the two owners by themselves. This is the worst place ive ever worked at. The way the employees treat the customers is unbelievable! My son who has a disability was embarrassed and treated very rudely by one of the employees. It embarrassed my son to the point that he cried and didn’t even want his smoothie afterwards. If you want to talk sarcastically to an adult that’s one thing but to talk to a kid in a rude manner is a big mistake. Newsflash….if you don’t like working with the public then maybe you should not apply for a job that does so! I walked in to Tropical Smoothie Cafe in Levittown, Long Island, New York and ordered a chicken and pesto flatbread without tomatoes. After waiting for about 15 minutes and not receiving my order, I asked one of the employees if my flatbread was ready. She said they lost my ticket and would do it right away. She then offered me a bag of chips to hold me over. I recieved a bag of pretzel and opened them. I noticed the pretzels tasted stale and so I looked at the expiration date which was from 2015. I quickly told the girl and she brought it in the back and then offered me a new bag of chips. The chicken pesto flatbread was finally ready and when took it home to eat it, the chicken was not cooked and i had to throw it out. I must say I am very disappointed with this Tropical Smoothie Location as I have had many terrible experiences with them. In the past, they have run out of pesto or other items. I have given them numerous chances and continue to go their for convenience sake. Now, I will be seeking other places. **VERY DISAPPOINTED**Tropical Smoothie at 3308 Central, Hot Springs, AR was one of the only places my daughter would eat; mostly because they serve vegan chicken and are known for “clean” eating. We go here at least two to three times a week. Today, we went for lunch and she ordered the same exact thing she has ordered every time we have gone. (They know her order before she even tells them.) Her first bite resulted in a disgusting look on her face and her spitting it back into a napkin. Apparently they have changed the recipe and are now adding what looked like Balsamic Vinegar to the wrap. Needless to say, she was not able to eat it. When we asked if they could make one without the nasty sauce on it we were told they could but we would have to pay for another one. Guess they no longer want our business!! By the way, they no longer serve Rockin Raspberry smoothies either! my daughter worked at tropical smoothie in Florida in port saint lucie, Us1 near hospital of port saint lucie. the manager is the worst, her name is sandy plus she doesn’t give w2 form to my daughter and doesn’t give breaks even after you have worked 5 hours straight not even 15min break. and she’s a minor and she had to work for 3 weeks straight without no days off. she eventually quick.